These skis scared me—and that was long before I even put them on snow. Take a look at that narrow tip and tail. Pay particular attention to that expansive 23.6-meter turn radius. And how about a crazy-slender 66mm waist underfoot? If you've been skiing for a while, the Course WC's geometry will probably look a little familiar. 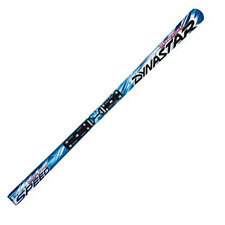 Indeed, riding Dynastar's Course World Cup ski, a pure-blooded GS race board, is somewhat like going back in time. The two questions that should immediately pop to mind are why? and what does this mean for me? Let's answer the first question right away: the Course WC's geometry (indeed nearly every aspect of the ski) is dictated by current FIS regulations for sanctioned World Cup races. This turns out to be kind of an interesting topic of discussion. Ostensibly, FIS equipment regulations are designed to ensure a level playing field for competitors. But that doesn't explain why FIS has chosen (as of 2011) such a stingy turn radius for GS racers. Ski technology has advanced dramatically since, for example, the days of Phil Mahre or Marc Girardelli. So why should racers in 2011 be forced to use skis that seem to mimic a shape imposed by technological and manufacturing limitations that have long since passed? Well, any answer to that question that I could give you would be pure speculation. What is clear is that there are consequences to jumping on a race stock ski that are immediately evident. Unless you live, sleep, and train on skis like these already, the relatively straight (rather than shaped) profile of the Dynastar Course GS means you'll be doing much more of the actual turning than you're used to. The Course WC recalls the good old days of feathering your ski underfoot to get the radius where you want it, then pressuring that edge for a hard exit across the hill. Only, compared to something current like Dynastar's race-oriented but unrestricted Course Ti, you may find the good old days don't look so good anymore. Where the Course WC did impress me was with its extraordinary edge grip. You'll probably need to get on snow that's been watered and salted to make these skis so much as blink. The Course WC is a ski that seems to live in continuous engagement with the snow. You ski them as if on rails, as if the ski itself refuses even for an instant to let go of the hill. Naturally, with grip that tenacious, you need to be especially attentive to the turn's initiation phase. You also need to mind how you shift from uphill to downhill edge. A mindless roll of the ankles won't cut it here: you may find your upper and lower body abruptly headed in different directions. What ever kind of turn you make with these, you will be working for it all the way. The confidence that the Course WC inspires at all speeds is of course stunning. The ski simply will not let you down. And yet...after a few runs on the Course WC, you may find yourself wondering where all the fun has gone. This is not a plank for pleasure cruising. It is all-business, a tool designed solely to enable you to ski a GS course as fast as possible, within the parameters of FIS-mandated specification. In short, it's a race ski for racers on race courses. No one else need apply.